Available today from Anchor Bay is that interesting horror offering from Robert Hall. Based on the web series of the same name and starring film icon Robert Englund, the film follows a group of tortured souls, haunted by their fears, and a unifying incident, and their plea for help from their doctor, Andover (Englund) who pioneered an isolation tank therapy in confronting fears. But it seems perhaps it wasn’t a box Andover created but perhaps it’s a door and the emotion that he has been denying sustenance for so long may be returning with a vengeance and is after those who have been denied it. Among the patients, each one of them suffering a crippling phobia, is Sara (Fiona Dourif) and Blake (Thomas Dekker), both of them suffering terrors and the recollections of a terrifying shooting they were involved in. It’s interesting that each of these characters was involved in the shooting, and perhaps a connection between that and the fear entity could have been a little more strongly suggested, as if it’s playing a game not only with them, but with Andover, and convincing him to use the machine again. Things get really bizarre the further the story rolls along, and it will either lose the viewer or catch their interest. I, personally liked how most of the story played out. The special effects are pretty strong, but it’s just the little things that make it creepy, like the snow falling up in a nightmare dreamscape Andover finds himself in, while confronting a former patient who dies in the machine, and her unnerving confrontation with him there. I quite like Englund’s turn in this film, and wish the film had let him play it out a little more. He was on top of things at one point, but apparently at some point during his time helping cure people things faltered and he tumbled. He now has doubts, and even some guilt over what he’s done. It’s an interesting character that, sadly, doesn’t get as much time as he should. The last half of the film, as mentioned, will either have you thinking WTF? or just diving into it, I tried to find a middle ground, as things began to get really word, and the entity found a physical form in our reality… the better to stalk the halls, my dear. And while it’s called a fear clinic, not enough time was spent delving into the fears of the patients, there’s a potent bug fear that works pretty well, but all of them could have been expanded on a little more to add some more terror and dread to the film’s atmosphere. 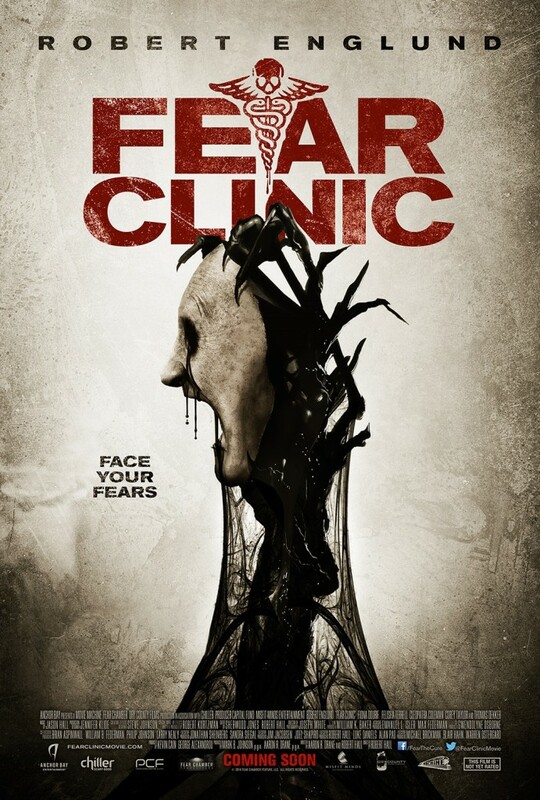 Fear Clinic is available today from Anchor Bay.